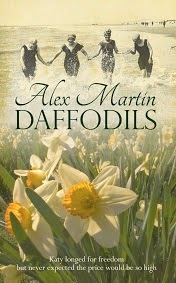 Daffodils featured here today and at a bargain price of #.99 cents! Don't forget - that sequel will be out this year so if you want to know about the characters - now's your chance to get them at a bargain price and be ahead of the story. Peace Lily is almost ready and you can then find out what happens in the aftermath of World War One to Katy and Jem, and Cassandra and Douglas. One thing's for sure - life was never the same again for any of them, whatever the war brought and whichever side of the Atlantic they end up on.